It’s (almost) the holiday season and that means Santa will be coming to town for the Magnificent Lights Festival and Tree-Lighting Parade. Enjoy live music, holiday-themed activities and visit with Santa in the Lights Festival Lane (aka Pioneer Court). 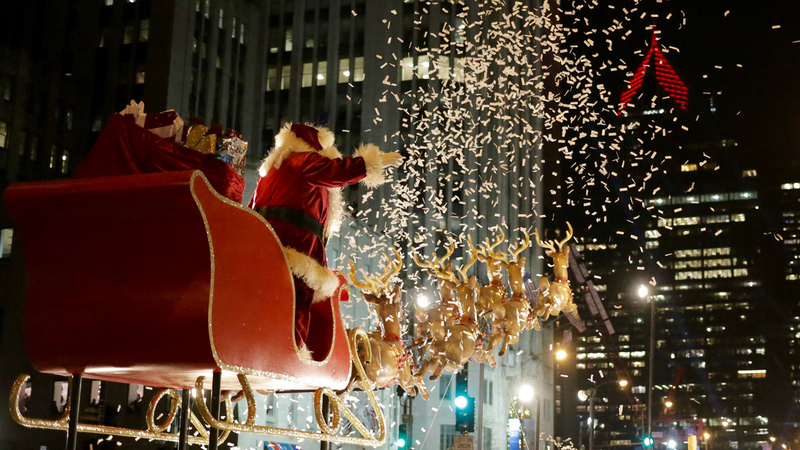 Bundle up Saturday and snag a spot along Michigan Avenue to watch dozens of floats, dancers, marching bands, musical performers, Disney characters and, of course, Santa Claus parade along the Mag Mile. Fireworks over the Chicago River cap off the night's activities. A 60-foot suburban tree is about to get dressed up for the holidays, Chicago-style. Kick off the season at the 105th annual Christmas Tree Lighting Ceremony, which also features “Hamilton” star Miguel Cervantes as emcee. After star gazing, head over to the Millennium Park Art Market to browse one-of-a-kind gifts made by more than 150 student artists, including those from the School of the Art Institute of Chicago. Heated tents keep you warm as you browse. It’s all fun and games at the Chicago Toy & Game Fair. Get a glimpse of the latest amuseuments before they hit the shelves, meet toy inventors and, of course, play! With games and activities for all ages, there’s something for everyone – even adults: New this year is a beer garden where you can play adult card games. Be sure to check out the WTTW Kids Big Idea Tour on Saturday. The annual Chicago Art Book Fair is not your typical book bash. Here, browse works from more than 125 arts publishers, small presses, book artists, comics artists, printmakers and others. Get a taste of French Baroque opera at “Actéon” and “Pygmalion,” a double bill by the Toronto-based Opera Atelier. Widely known for its approach to the preservation and interpretation of 17th and 18th century opera, this marks the company’s Chicago debut. Watch goddess Diana transform a hunter into a stag in Marc-Antoine Charpentier’s “Actéon.” In Jean-Phillippe Rameau’s “Pygmalion,” discover the tale of a statue brought to life. Both pieces will be performed in French with English surtitles. Smell, taste, touch, listen and feel your way through In the Realm of Senses: Elements, a multi-sensory exhibit combining visual arts, music, gastronomy, perfumery, poetry and touch. Push the boundaries and perceptions of your five senses as you explore the installations spread across a trio of studios. Note: tickets are limited to 100 per day. Raise your tasting glass to a smorgasbord of styles at the Festival of Wood & Barrel-Aged Beer, where you can try some of the “most exotic barrel-aged beer, cider, mead and perry on Earth” by more than 200 breweries, according to organizers. Each ticket comes with a complimentary tasting glass, festival booklet and 20 samples. Trade the bright lights of the city for celestial bodies and the glow of the campfire at Stars, Stories and S’mores. The family friendly evening includes storytelling, astronomy and night hikes. City residents of all stripes are the focus of photographer Abigail Zoe Martin’s exhibition “Chicago Lights.” The 81 photos include shots of the Rev. Michael Pfleger, Mayor Rahm Emanuel and Chicago Bear Israel Idonije. Each subject chose the setting and style of their photo before nominating the next person to be photographed. Each photo includes a 1-minute snippet of conversations Martin had with her subjects. An opening reception takes place 7-10 p.m. Friday.